Food contamination is not desired by producers or consumers. Safety factor is important in order to prevent side effects due to food contamination that can endanger health. Contamination in food occurs from small to large industries. Sanitation also plays an important role in many industries including the food industry. The research subject was a home industry of beans-based healthy drinks (BBHD), such as mung beans, soybeans, and red beanss drinks at Jukajo Sukses Mulia home industry in Tangerang Regency. This study was conducted to determine the level of security, sanitation, and sources of contamination in the BBHD industry Tangerang Regency. This study was carried out through observation and interview with the owner and the workers of Jukajo Sukses Mulia home industry. The result showed that the level of security and sanitation in the production environment was quite good. The potential source of contamination in the production process was the hygiene of the employees and the cleanliness of the production equipment. The critical control points were be located in filling, chilling, and storing processes. Total plate count value of mung beans, soybeans, and cashwes drinks were too numerous to count (TNTC), 3 x 103, and 2 x 102CFU/ml, respectively. RIANTI, Angelina et al. PENERAPAN KEAMANAN DAN SANITASI PANGAN PADA PRODUKSI MINUMAN SEHAT KACANG-KACANGAN UMKM JUKAJO SUKSES MULIA DI KABUPATEN TANGERANG. JURNAL AGROTEKNOLOGI, [S.l. ], v. 12, n. 02, p. 167-175, dec. 2018. ISSN 2502-4906. 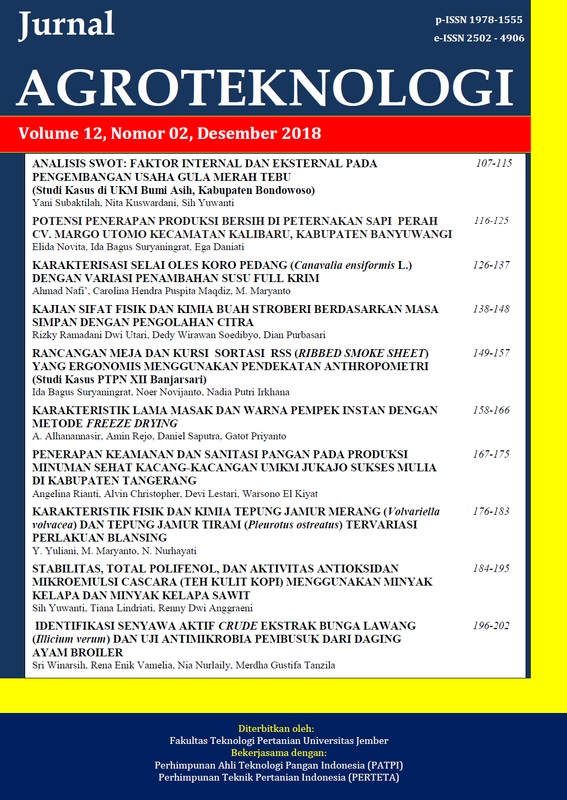 Available at: <https://jurnal.unej.ac.id/index.php/JAGT/article/view/9283>. Date accessed: 23 apr. 2019. doi: https://doi.org/10.19184/j-agt.v12i02.9283.